Live scores and updates of IPL 7 match between Rajasthan Royals vs Chennai Super Kings. Rajasthan Royals lock horns with Chennai Super Kings at Dubai International Cricket Stadium. The match starts at 8 pm IST. Follow this link for all the live scores and updates. FirstpostMaxwell continued his rampaging run by smashing yet another blistering 95 — making good use of the two lives that he got during his innings by cracking nine sixes and five fours. 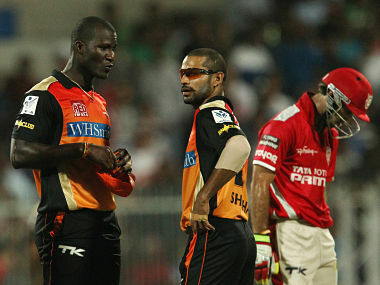 FirstpostSRH skipper Shikhar Dhawan today put the blame for their crushing 72-run defeat against Kings XI Punjab on their fielding lapses and batting failure. Just one run off the Ashwin over! Not out! Full outside off, it zips away and beats Watson who leans forward for a prod. Dhoni whips the bails off in a flash. Replays show that Watson didn't lift his foot! SIX! Watson gets to the pitch of the ball and lofts Jadeja it over long on. 6 runs and 2 wickets off Jadeja over. Just 3 runs off the Raina over to follow up! Steven Smith and Stuart Binny are at the crease! 6 runs off the 9th over. RR 53/4 after 9 overs! Oh boy! Raina bowls a lovely off spinner, Smith uses his feet and looks to turn it to the leg side but misses, Dhoni fumbles and Smith gets back in! Smith was a long way down the track. Just 3 runs off the Ishwar Pandey over! RR 66/5 after 12 overs! DROPPED! Brilliant attempt from Mohit Sharma! 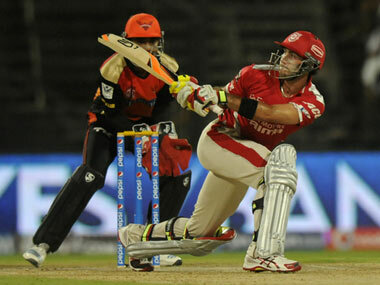 Smith mistimes his loft to long off where Mohit moves to his right, dives forward but doesn't manage to hod on to it! FOUR! Brilliant shot! Smith uses his feet and rams it wide of long off. Tim Southee is the new batsman! Dropped! Good length delivery outside off, Southee guides wide of fist slip, du Plessis dives to his right but doesn't manage to hold on to it! 57 needed off 36 now! Just 3 runs and a wicket off the Jadeja over. RR need 54 from 30 balls with 2 wkts in hand! Dhawal Kulkarni and Rajat Bhatia are at the crease. Can Bhatia be the hero with the bat too? SIX! Bhatia whizzes down the track and launches Jadeja over long on. FOUR! Short from Jadeja and Bhatia pulls it to deep square leg for a boundary. 34 needed from 18 balls! 5 runs from the Ashwin over. RR need 29 from 12 balls! All RR need is a blinder from Bhatia now! Kulkarni gets a single off the first ball, 28 needed off 11 now! Swing and a miss! Back of a length delivery outside off, Bhatia swings and misses. OUT! Bhatia miscues his swing high in the air and Ashwin makes not mistake at point. R Bhatia c Ashwin b Hilfenhaus 23 (20b 1x4 1x6) This might be it for RR! RR need 24 off the last over. Tambe and Kulkarni are at the crease. A single off the first ball! SIX! Kulkarni heaves this one over mid-wicket. 17 needed off 4! Kulkarni mistimes his loft over extra cover, a couple taken! 15 needed off 3 now! SIX! Oh boy! Kulkarni is keeping them in hunt. Launches this one over deep square leg. 9 needed off 2! That's it! CSK win by 7 runs as Tambe is run out. What was Tambe thinking? Kulkarni heaves one wide of long on, he straightaway sets for the second, Tambe is reluctant but then sets off but the throw in the deep is good and Ashwin clips the bails off. Tambe is nowhere in the picture. CSK have hit back hard with 2 wins after loss in first game.